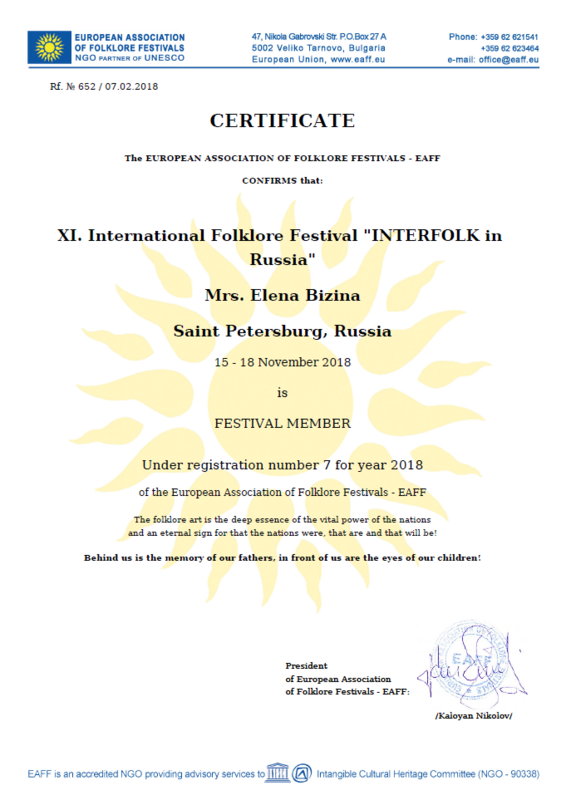 Each participant group is welcome to choose: participation in the Festival only, participation both in the Festival and in the Competition, participation in the Competition only. The group’s choice and decision must be stated in the application form. Groups enacting parts of folk ceremonies, rituals, popular games, etc. Each participant group has a rehearsal (stage trial). The schedule of their trials is devised by the secretary IN ADVANCE (before the participants’ arrival). Contest is open for general public. For the First Round artists will present one (1) or two (2) varies works based on traditional (folklore) material of any country up to 10 minutes. The Results of the contest and the awarding will be held during the 2nd round. Only Winners with Gold diplomas will pass in the second round (the winners with Silver diplomas can participate by jury decision). The group will perform one piece not more that 4 minutes. PLEASE, NOTICE! Phonogram (+) for vocal groups is NOT ALLOWED! The participants pay the fee immediately sending in the application form and no later than September 15, 2017. In case of refusal to participate in the event received after October 1, 2017 the entrance fee is not refund. The Organizing Committee will send the bank details upon receiving the application form.